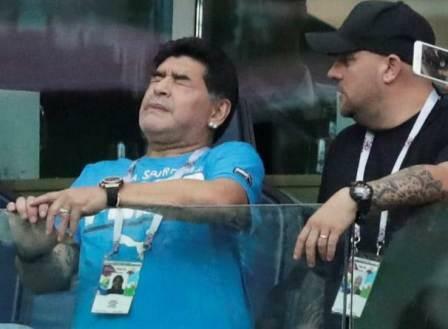 Argehtina’s victory was too much for Diego Maradona. It appears he collapsed and was treated by paramedics following Argentina’s victory over Nigeria at the World Cup in Russia. Maradona was attended to by Russian paramedics inside the stadium. Sources close to the Argentina Football Association said the former player had been “stabilised” after concerns over his blood pressure. Reports say thatMaradona’s behaviour had been erratic throughout the evening. Before the game had even begun, he was photographed slumped forward in his seat in the front row of the VIP box, propped up by the metal railing. Later on in the game, television cameras caught him dancing with a female Nigerian fan and then gesturing obscenely to the crowd. He displayed the middle finger of both hands simultaneously. The gesture could prompt an investigation for aggressive behaviour that could incite violence at a football match.